“This all-occasion coffee cake is light, high rising, quick and easy to make. 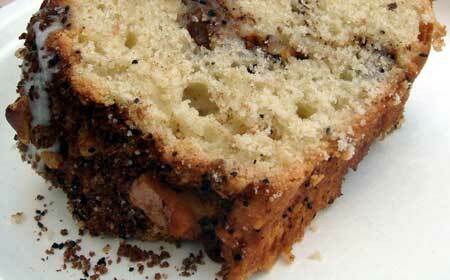 It has a delicious crunchy caramel-walnut topping on, and throughout the coffee cake”. Preheat oven to 350F. Grease an 8” round or square baking pan. Wisk together in a medium bowl, the egg, oil and milk. Add baking mix contents from the package (reserve topping bag), and mix thoroughly with a spoon. Level batter into prepared pan. Topping will go on the raw batter. Melt 2 Tbsp. butter then stir in walnuts and brown sugar from topping bag. Place topping on the coffee cake center, then spread over the top, evenly, right to the edges. Bake 30 to 32 minutes, or until a pick inserted into the center comes out clean.